I love your card so much Scrappy ! Great image and I love what you did with the ribbon ! 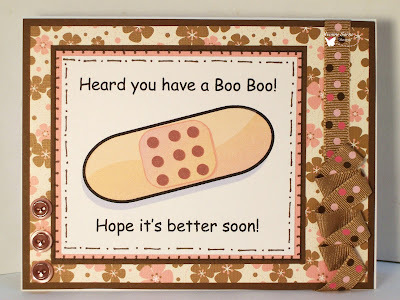 What a neat little get well card. I love what you did with the ribbon. I've got to try that! Thanks coming back for Challenge # 2 at Amber's Crafts and Stuff! I hope you will join us again next Wednesday for Challenge #3! So adorable!!! I'm just gaga over pink and brown together!! Thanks for joining Challenge #2 at Amber's Crafts & Stuff! Your card is so great! I love the way you did your ribbon and the buttons are great! Thanks for playing along at Clear It Out. A great card. Lovely colors and layout. Thank you so much for joining us at Digital Tuesday this week. 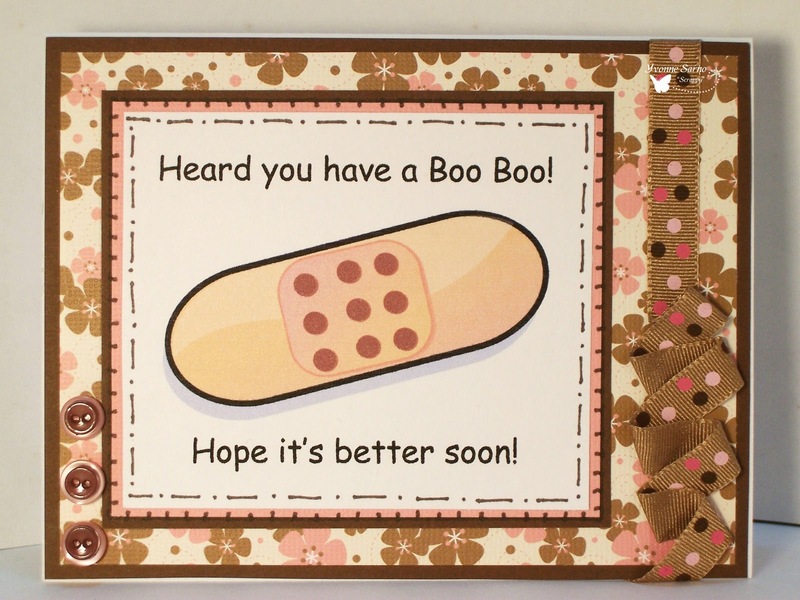 Oh, I love your boo boo card! Your papers are beautiful and is perfect for the challenge! Thanks for joining us at Card-Ideas this week. Very cute!! I love what you did with the ribbon! Thanks for joining us at Card Ideas! Cute card! Thanks for joining us at Card-Ideas! Love how you did your ribbon on the side of this cute card. This is so cute! Thank you for playing along with us on Card Ideas! Cute!!! Love that ribbon detail. Thanks for joining us at My Partner In Crafting Crime. What a great get well card. Very cute. Thanks for sharing with us at GingerLoft Challenges! hey scrappy! how cute is this! i KNOW that boo boo is better already! thank you so much for joining us at PCC. Super cute card and I love how you did the ribbon! Thanks for joining the challenge at Lexi's Creations this week.